If you read my blog regularly, you know that I have as many unhappy as happy memories of my childhood—mostly because my mother was verbally and emotionally abusive much of my life. I’ve written over fifty blog posts (usually in my “Mental Health Monday” series) about caregiving for Mom since 2007. When I visited her this week on my way to and from Fairhope, Alabama, I found her slipping ever farther away, her mind tangled with advanced Alzheimer’s disease. I’ve forgiven her and come to understand more about why she was the way she was in the past few years, leaving me with more compassion for her, and sending me on a search for more happy memories. This morning I made fudge for a cookie swap I’m going to tomorrow morning. Watching the chocolaty mixture develop that shine as it melted and blended together, smelling the seductive aroma of the butter and chocolate, tasting the warm mixture as I spread it over sheets of waxed paper, took me back to memories of making fudge with my mother many times in my childhood. It was one of my favorite activities. Every time Mom and I made fudge, she would tell me about her favorite childhood memory—making pecan divinity with her mother. Mom was a sickly child, with asthma that kept her inside a lot, especially during the winter months, even in Meridian, Mississippi. 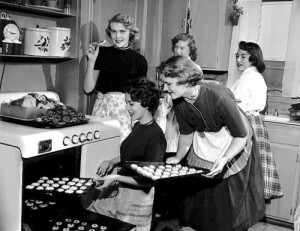 To keep her entertained, Mamaw (her mother) would let her help make pecan divinity. If you’ve never had (a homemade version of) this confection, you’ve missed a real treat. I understand why they call it divinity—it is truly divine! But for whatever reason, Mom and I never made it. But we made outstanding fudge. I made sugar cookies with my own children—the kind you decorate with sprinkles and frosting and candies. And I love doing this with my granddaughters when we visit them in Denver, as we’ll be doing again this Christmas. Oh, and my daughter-in-law bought those little gingerbread house kits for me to make with her girls last year, which is another fun tradition. 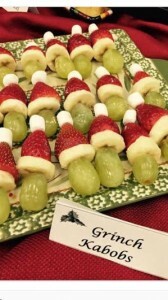 Recently she sent me this picture of “Grinch Kabobs,” which you can make with grapes, bananas, strawberries and miniature marshmallows. Maybe we’ll make some of those this year. I hope that however dysfunctional (or not) your childhood home was, you can find some good memories to focus on during this Christmas season. My eyes are filled with tears and a smile is spreading across my face as I type these words. I’m so thankful to my grandmother and my mother for these nurturing memories. No, my life hasn’t been perfect, but making fudge this morning has brought to mind something good: three generations of sweetness. You have certainly made me smile, too, Susan. Susan, your story is so sad but very glad. Cry when you must, don’t keep it all in. May you have a wonderful trip to visit your family in Denver. Merry Christmas! Bless all of you. Holiday sweets memories are close to many hearts. At a recent poetry workshop, I wrote a poem about my husband and our daughters making gingerbread together as they did for many years – and still do in years when our now adult daughters can be here for Christmas.